LAK’18 Registration is now open! How to find the SoLAR Members discount code for LAK and LASI? Membership in SoLAR includes discounted registration rates for LAK and LASI. This year we are introducing a more secure way of delivering your individual registration discount code. Once you renew your membership, your code will be available on your profile page. In case you forgot username and/or password, please contact us. We are always happy to help! That’s it! You will need to enter this code when registering for LAK or LASI. The LASI-Asia 2016 will run 19-20 September in Seoul. To share global experiences and outcomes with Asian people, major international organizations and stakeholders related to learning analytics participate in this event as organizers and sponsors. ISO/IEC JTC1 SC36 (Information Technology for Learning, Education, and Training) and IMS Global Learning Consortium will share their outcomes for reference model and learning data APIS for learning analytics, and the Learning Analytics Community Exchange (LACE) project – an initiative funded by the EU’s FP7 programme – will share its research outcomes. Keynote addresses from Dai Griffiths, Simon Buckingham Shum, Charles Severance and Rob Abel will give insights for global collaboration and envisioning learning analytics for the future. Also many case studies and research outcomes to realize learning analytics will be introduced in this conference and workshops. In particular, standardization communities, LACE project and SIG of SoLAR will get momentum and move forward for learning data APIs interoperability through collaboration from the LASI-Asia 2016. Learn more on the LASI-Asia 2016 website: http://www.lasi-asia.org. BayLearn will be a regional event to facilitate the exchange of information, case studies, ideas, and early stage research in the field of learning analytics. From this event, we aim to grow a local network of researchers and professionals in the field of learning analytics, which can be used to exchange and validate innovative ideas and to provide local access to research and expertise. The initial meeting of this organization will be an official Society for Learning Analytics Research (SoLAR) FLARE event. SoLAR is an inter-disciplinary network of leading international researchers who are exploring the role and impact of analytics on teaching, learning, training and development. September 30, 1-7 pm, SRI International (Palo Alto). In this kick-off meeting for BayLearn, we want to bring together the learning analytics community in the Bay area to discuss innovations and challenges in learning analytics. We are pleased to announce new academic and industry job vacancies. More details available at SoLAR Job Board! The Society for Learning Analytics Research (SoLAR) just finished uploading video recordings of most LAK16 presentations. They are all available directly from the conference program or on the SoLAR’s official Youtube channel in the LAK16 playlist. LASI’16 video recordings are available on our official Youtube channel, as well. 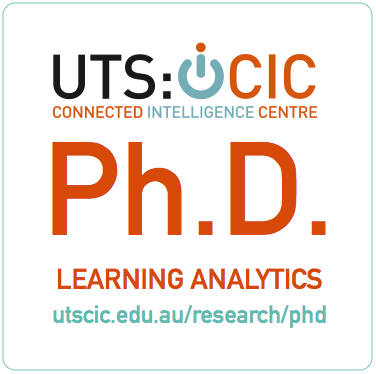 The Connected Intelligence Centre at the University of Technology Sydney is pleased to announce the launch of their doctoral program in Learning Analytics, offering three UTS Scholarships to begin your research at the start of 2016. CIC’s mission is to invent, evaluate and theorise the design of human-centered data science and learning analytics to advance the UTS Teaching & Learning program. As you will see from our Research Themes and the three PhD topics advertised, a core theme is analytics techniques to nurture in learners the creative, critical, sensemaking qualities needed for lifelong learning, employment and citizenship in a complex, data-saturated society. While our first priority is the future of learning and teaching, we also anticipate broader applications of the tools we develop, to address data science challenges in other research fields and in UTS business operations. We invite you to apply for a place if you are committed to working in a transdisciplinary team to invent user-centered analytics tools in close partnership with the UTS staff and students who are our ‘clients’. Please explore the website so you understand the context in which we work, and the research topics we are supervising. We look forward to hearing why you wish to join CIC, and how your background, skills and aspirations could advance this program. After a successful meeting of people interested in learning analytics last year, the Learning Analytics Community Exchange (LACE) project will be holding a another exciting SoLAR Flare event at The Open University, Milton Keynes, UK, on Friday October 9, 2015 from 9:30am to 4:45pm. This is a networking gathering for everyone interested in learning analytics. Under the auspices of the Society for Learning Analytics Research (SoLAR) and organised by Europe’s Learning Analytics Community Exchange (LACE), this event forms part of an international series. SoLAR Flares provide opportunities to learn what’s going in learning analytics research and practice, to share resources and experience, and to forge valuable new connections. The 2014 – 2015 Learning Analytics Speaker Series at Emory University hosted by the Institute for Quantitative Theory and Methods aims to stimulate conversations about the use of educational data to promote student success, however that may be conceived. In November 2014, Alyssa Wise (Associate Professor of Educational Technology & Learning Design, Simon Fraser University) discussed the need to consider how educational data might be embedded within learning environments themselves, as an integral part of the teaching and learning process. She presented a framework for linking pedagogical intent and student activity through data-based reflection, and used work from the E-Listening Project at Simon Fraser University as an initial example of how this framework might me implemented. In Spring 2015, the speaker series will continue with lectures from Ryan Baker, John Whitmer, and Dragan Gašević. As with lectures in the series from Fall 2014, these will be professionally recorded, produced, and made publicly available via the Emory University YouTube Channel. For more information about the Learning Analytics Speaker Series, and about learning analytics at Emory University more generally, please visit Analytics for Learning at Emory (ALE).